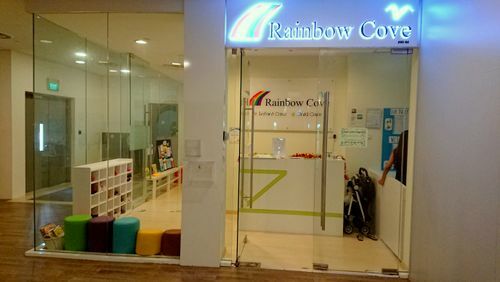 Preschool Rainbow Cove has five locations in Singapore, including one within Alexandra Retail Centre (460 Alexandra Road). Established in 2002, Rainbow Cove is a Montessori pre-school registered with the Singapore Ministry of Education. The preschool offers programmes for children aged 18 months to 6 years. Rainbow Cove’s teachers and curriculum cater to the individual needs of children, gently encouraging the child to learn at his or her own pace while developing in-depth world knowledge and essential life skills. The school’s environment itself has been designed to encourage experiential and investigative learning with classrooms that have been set up with learning corners – from imaginative play to life skills to reading – setting the foundation for school readiness. Rainbow Cove’s Playgroup Program, for children 18 months to 2 years 11 months, is designed to encourage positive self-concept and to foster social, intellectual, physical and emotional development of the children. Nursery 1 & 2 Program, meanwhile, for children 3 years to 4 years 11 months, is designed to build on previous preschool and other learning experiences to prepare the children for the kindergarden classes. Kindergarden 1 & 2, on the other hand, for children 5 years to 6 years 11 months, has been designed to support and promote children’s learning and development towards formal schooling through individual and group activities. Each of the Rainbow Cove preschools has its own Facebook page, where the preschool shares news, updates, and detailed information about upcoming classes. For example, Facebook page for Rainbow Cove Alexandra Retail Centre is at www.facebook.com/RainbowCoveAlexandra/.